In 2001, Pixar Animation Studios opened up the bedroom door into the monstrous world of Mike and Sulley, the lovable duo for whom scaring the children of the human world is just the usual 9 to 5, in the instant-classic, animated film Monsters, Inc. Now, 12 years on, the unstoppable Billy Crystal and John Goodman voiced double act are headed back to school to discover where it all began, in prequel Monsters University. Set well in advance of the original film, Pixar's first prequel sees Mike Wazowski and James P. Sullivan's university days in the School of Scaring at the prestigious Monsters University. The youthful dreams of two ambitious scaring majors are the same, yet their ethos of getting there couldn't be more different, and when the pair meet for the first time these inseparable friends rather surprisingly bring out the worst in one another as their differences cause them to clash. As a fierce rivalry instantly emerges with severe consequences that threaten their prospective futures in scaring, the duo must learn to work together with one another to succeed in the annual Scare Games - competing as part of the underdog fraternity, Oozma Kappa. Things get off to a rough start between future friends Mike and Sulley in Monsters University. The difficulty in creating a prequel is quite obviously that going into the film, you already know how it is going to end - and just by reading the above synopsis I'm sure you can gage a good idea of how Monsters University will pan out. Therefore, it is to the credit and creativity of the filmmakers at Pixar that they are able to pull off a prequel that despite this inevitable hurdle is actually able to play the time-setting to its advantage and throw some unexpected curve balls at you along the way too, as Mike's story takes front and centre this time around. It's of course all about the journey rather than the destination, and the film's message of dreams and ambitions going awry, and finding the silver lining in that moment of revelation which resonates with the film is a bold and ambitious one, and has a strong emotional pay-off to it. It won't have you crying into your 3D glasses like the opening of Up or the climax of Toy Story 3, but these engaging and relatable characters, regardless of how monstrous they may appear, have a pure human soul that we can all relate to on some level. Everyone will have had their dreams shattered at some point in their life - where lifelong plans are scuppered in an instant - for those people, this is their film; when the traditional 'work hard and you'll achieve' moral just won't cut it anymore because it just won't happen, the message that something even better come when you accept yourself for who you are is truthful and powerful. Yet Monsters University is not a film designed to tug at the heart strings. If the conclusion to the original film has taught us anything, it is that laughter is the most powerful form of emotion of all, and for people sitting down to watch Monsters University, prepare yourself for what it quite possibly the funniest film in Pixar's 14 film history. 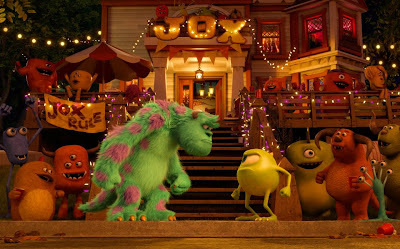 Whilst all of the studio's other films have had a noticeable focus on the humour, from the very first frame right to the end of the credits, Monsters University focuses on the laughter department more so than any other Pixar film to date, and absolutely delivers at each and every opportunity; with it's fantastic dialogue and well-timed slapstick set pieces coming from the comedic mind of fresh-blood director Dan Scanlon. 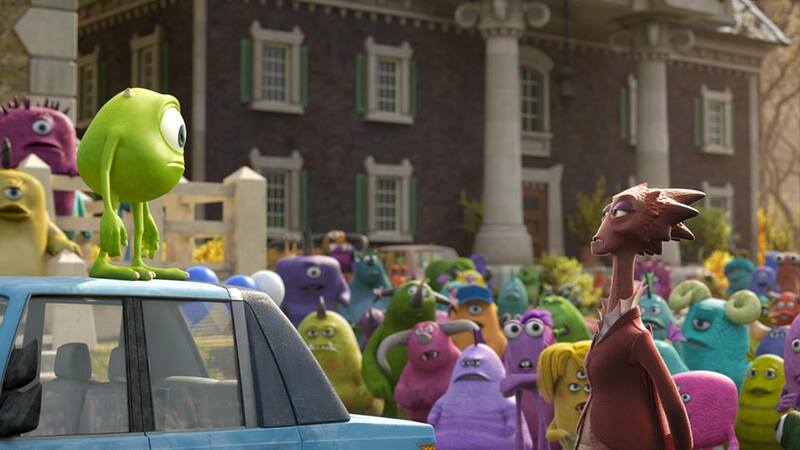 Mike stands up to the fearsome Dean Hardscrabble (Helen Mirren) in Monsters University. As the film opens onto the very first shot, we are instantly reminded of the richly creative world that we are returning to - and Monstropolis has never looked better. Expanding the world to venture into the university environment feels like a very natural move, as we stay in the brilliant concept of the 'everyday' working life that made the concept of the original so wonderfully unique: if the first saw the monsters going to the factory for the 9 to 5, then it makes sense to focus on another career-based institution such as the schooling system. With that concept instantly comes a fresh twist on a recognisable world, and whilst the usual college movie antics are obviously toned down a bit for the family market - there are no monsters doing Jäger shots, although most of them do walk around naked - it still has the natural feeling of a university environment, and all of the recognisable individual types that you would come to expect from it too. It's the world's first family college movie, and it's every bit as funny as you want it to be. Naturally, with the original film being so well loved by people all over the world, the question is often asked as to whether University is an equal or worthwhile follow-up to Inc. Of course we don't need a follow-up, especially not with the original being the classic, fully-closed story that it is, but instinctively there is the concern that returning to the franchise unnecessarily can sour the memory of a well loved film (just ask the adults who grew up with the original Star Wars films as a child) - but when do we ever need a film? 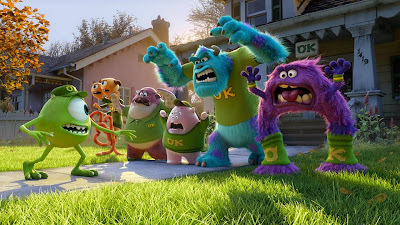 What the prequel element of Monsters University allows the filmmakers to do is to return to some familiar faces, and at the same time have some fun with your memory of them by twisting your expectations, or just by simply having fun with their youthful appearances. There are so many little nods and winks towards the original, allowing the film to actually improve your appreciation and understanding of the monster world and its inhabitants in many ways - you'll certainly never look at Steve Buscemi's Radall the same way again. However it is naturally the friendship between Mike and Sulley that benefits the most from the prequel, as watching the inseparable pair becoming the unbeatable team that we know them to be by setting aside their differences - and in fact using them to their own advantage - really makes you understand and appreciate their story from the original film on another level. Regardless of how it compares to the original, as a stand-alone film, it is nothing short of a complete joy to see the pair back on the big screen together in a film that focuses on further exploring these characters - the original film's two greatest assets. How will underdog fraternity Oozma Kappa fare in the Scare Games of Monsters University? So to answer the question on everyone's lips: it's tough to say if Monsters University is as good as the original, as it is very different film, and they both have strengths in different areas. What it does do is absolutely stand-up alongside it; perhaps some of the originality has worn off (as you'd expect from returning to a franchise, you've seen this world before), and it may not have a set-piece as extraordinary and unforgettable as the door chase sequence of the first (although what film does!? ), it's a laugh out loud hilarious film that will have audiences members of all ages roaring with laughter from start to finish, with an engaging and heart-warming story that packs a bold and valuable message at the same time. Monsters University (certificate U) is released in cinemas across the UK on July 12th. Are you looking forward to enrolling into Monsters University? Perhaps you already have? Leave your thoughts and opinions in the comments section below!